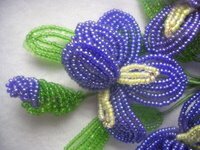 My sister in law Sandra is the most meticulous handcrafter I know. 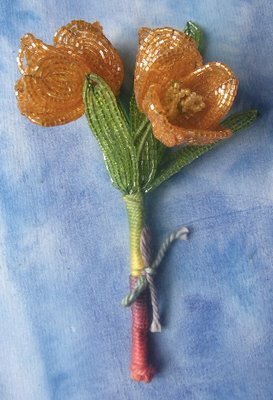 She has been making small posies of French beaded flowers for the past few years and develops her own methods to get the results she wants or to make flowers and leaves that aren't in any of the books she has on the topic. Here you see tulips and a close-up of an iris she gave to me. Sandra recommends The Art of French Beaded Flowers by Carol Benner Doelp for beginners to the craft. Commenter Karen asked if Sandra accepts commissions and the answer is Yes! Write to me cbshiffman at yahoo dot com if you want to know more. How lovely! Does Sandra accept commissions?